A stunning use of seasonal citrus, this rustic blood orange galette is the perfect dessert for Sunday dinner, family dinners and elegant enough for or entertaining. Sweet and tangy sliced blood oranges and nutmeg flavored orange marmalade are wrapped in a flaky, buttery crust. Whether you serve it on its own or adorn with a dollop of fresh cream or ice cream, this galette is a stunner but it is really easy to make. 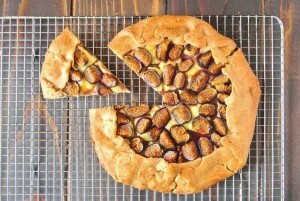 A galette is fancy name for a tart that is so forgiving and doesn’t have to be perfect, rustic is in. If you can make pastry, then you can make this galette. What is even easier is, the pastry is made in the food processor. The most labor involved in this recipe is rolling out the dough and I know you can handle that. The beauty is, the pastry doesn’t have to be perfect. After rolling out the pastry into a large round, orange marmalade that is flavored with fresh nutmeg and complements the orange beautifully, the orange slices are arranged on top leaving a border. This border is folded over, you don’t have to worry about it being smooth, embrace the folds, if it cracks patch it. After all, it is rustic. Winter is citrus season and the perfect time for the juiciest, sweetest blood oranges and this rustic blood orange galette is about as easy it gets to achieve a stunning dessert that is not too sweet and a little tangy and so good. 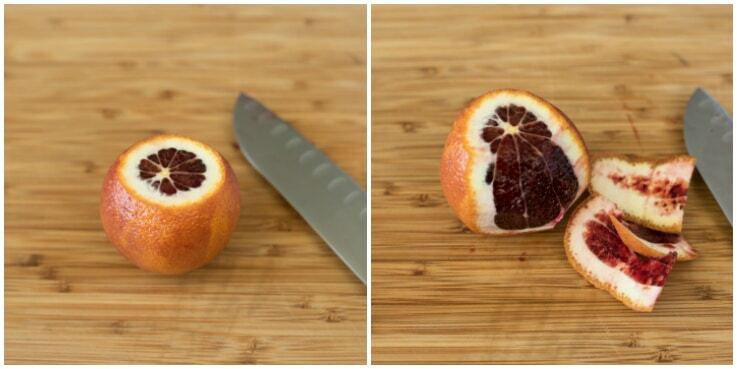 To get perfect orange slices, you need to cut the top and bottom off the orange. Then working from top to bottom, slice the sides of the peel working your way around the orange until all the peel and white is gone, then cut the slices. For a color contrast (and because I can’t help myself) I always want the best presentation, so I added a few slices of mandarin orange. These are completely optional, but if you like the look, go for it. Another presentation idea that you can bring right to the table is, serving galette on a flat, cast iron griddle. It’s 11 inches and the perfect side for this recipe. If you don’t have one, a parchment lined baking sheet works just as well. 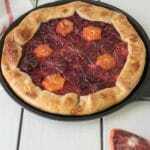 If you’ve tried this rustic blood orange galette recipe or any other recipe on the blog then don’t forget to rate the recipe and let me know how you got on in the comments below. I love to hear from my readers! You can also FOLLOW ME on FACEBOOK, TWITTER, INSTAGRAM and PINTEREST to see daily recipe updates. Sweet and tangy sliced blood oranges, orange marmalade spiked with fresh nutmeg are wrapped in a flaky, buttery crust. To a food processor fitted with a metal blade add the flour, butter, sugar, salt and nutmeg. Pulse until the mixture resembles coarse meal, about 5 to 10 seconds. Add the orange zest. With the processor running, pour enough the water through the tube in a steady stream until the dough forms a ball. You may not use all the water. Do not over mix. Dust a clean work surface with flour. Remove the dough from the processor, turn out onto the floured surface and knead for 1 minute. Form the dough into a ball, wrap in plastic wrap and refrigerate for 1 hour. To a small bowl add the marmalade and nutmeg, mix well. Set aside. Roll dough out to a 13 ½ inch round. Spread the 3 tablespoons marmalade all over the pastry, leaving a 1 ½ inch border. Arrange the orange slices in an even layer. Fold the pastry border over to the edge of the fruit. Brush the pastry edge with the egg wash and sprinkle lightly with sugar (optional). Bake for 25-30 minutes or until golden brown (all ovens vary). When the galette is done, remove from the oven and brush the oranges with the marmalade. Transfer to a cooling rack and allow to cool completely. What a gorgeous tart…blood oranges add a great color! What a stunning looking dessert I bet it tastes incredible too! Blood orange really does make everything look stunning doesn’t it. This looks really beautiful and delicious too. I have only ever used blood oranges in margaritas! Ha! This looks like a fabulous way to incorporate them into a dessert. Beautiful!